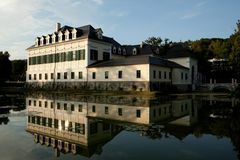 Schloss Laudon, the most beautiful moated castle in Vienna, offers the perfect setting for an atmospheric chamber music festival. Listen to the aron quartet from August 20 to 26, 2018. Count Gideon Laudon, after whom the castle was named, was considered one of the greatest patrons of art and culture of his time, and this alone was inspiration enough for the aron quartet of Vienna to turn the chamber music festival idea into reality - 2018 for the 11th time. The festival offers a rich selection of Classical and Romantic chamber works, as well as milestones of the 20th century repertoire: music by Wolfgang Amadeus Mozart, Joseph Haydn, Ludwig van Beethoven, Dmitri Schostakowitsch, Arnold Schoenberg and more. Guest appearances include pianist Gottfried Wallisch, for example.